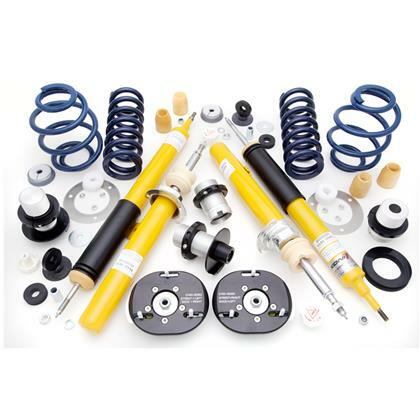 Front Maximum Lowering (in) 1"
Kit Contents Coil-Over Spring Set , Matching Front Bump-Stops, Adjustable Camber plates, Threaded adjustment collars, Suspension packers, Heavy Duty Brackets, Front Struts and Rear Shocks. Rear Maximum Lowering (in) 1"
For the enthusiast that needs adjustable ride height the Dinan Coil-Over Track Suspension is for you. Dinan’s design replaces the stock shocks and struts with custom units built for Dinan by Koni. Each shock and strut comes with damping control and can be adjusted while installed on the car, unlike others that need to be completely dismantled. These custom shocks and struts dramatically improve the handling response. Billet threaded collar assemblies allow the driver to change the BMWs ride height. Dinan provides beehive shaped front springs and low profile camber plates with progressive bumpstops that allow the vehicle to be lowered up to an impressive 1.00” inch and still maintain stock suspension travel. Dinan’s Quiet Design Camber Plates make it the quietest coil-over suspension on the market. Suspension packers are included to fine tune handling and comfort by changing the clearance of the progressive bump-stops, something no respectable racecar is without. Camber is easy to adjust due to the slotted front mounts and is adjustable between -1.2 to -3.2 degrees. Strut mounts are machined from 6061-T6 aluminum, and are designed with heavy-duty rubber and barrel shaped Delran internal components for superior performance and quiet operation, compared to noisy spherical bearing style mounts. All components are compatible with 2.50” I.D. racing springs for convenient adjustment. Quiet Design Camber Plates make it the quietest coil-over suspension on the market so you can live with it every day. Beehive shaped front spring and low profile camber plates to maintain full suspension travel with up to one inch of lowering. Threaded collars allow easy front & rear vehicle height adjustments. Included suspension packers allow adjustment of bump-stop clearance to fine-tune handling and comfort. Dinan-spec progressive bump stops improve ride quality at lowered ride heights. System comes with adjustable camber plates allowing easy camber adjustment between -1.2° and -3.2°. Camber plates are machined from 6061-T6 aluminum, and are designed with heavy-duty rubber and barrel shaped Delran internal components for superior performance and quiet operation, compared to noisy spherical bearing style mounts. Front & rear Dinan components are compatible with 2.50” I.D. racing springs.